The unique JRS eco-wifi operating system installed on one of the fastest Asus routers. We are very happy with the significantly reduced E-smog when using the JRS Eco. We had measurements done in the before and after situation and the difference was stunning. Funny thing was that when still had the Wifi signal of the internet access router active, that completely blocked the JRS Eco signal. We had a slight software issue, but fortunately Jan who was on holiday in Alicante came and sorted out the issue. His service was impeccable. The eco Wi-Fi is a fantastic router and meets our requirements. We’ve hard wired the house as well, and the Wi-Fi is there as an option. Modern Wi-Fi technology is here to stay. I’m happy that Jan has a product that enables use of this technology without the adverse heakth risks. I had long had my eye on this router when we really couldn’t get away with not having wifi anymore. Because we want as little EMFs as possible in the house, we have wired everything in the house with network ports everywhere you can plug in. Only with the iPhone and iPad it was sometimes difficult, but with a lot of data in your bundle you can get a long way. However, since Apple has completely removed the Apps from iTunes, updating and downloading apps is no longer possible via cable and to avoid having to go all the time to the local coffee shop for wifi, I have chosen this router. It is not difficult to install, but you need to take some time and read the user manual carefully. There is a lot to set up on this router, but the most important things are very clearly explained in the manual. The transmission power can be set from 1 to 400. By default, this is set to 30 and it is recommended not to exceed 70. Because of the thick walls in this house, 40 was the lowest possible to get a reasonable range and that works fine. The possibility to create different time schedules under ‘Access Restriction’ is very useful. You can determine at which times the wifi goes off and on automatically. For example, you can configure the wifi to be switched off automatically at night. You can also temporarily turn off wifi at the touch of a button if you do not use it. Great company and product. I was interested in a product that reduced the amount of wifi because of family members with neurological problems. I can definitely tell a difference by using the eco wifi, much improvement in our home. Will recommend to others. The router is great. The reason for purchasing it is to try to to limit the radiation. Although this is not really noticeable for us, I assume that the router takes care of it. If someone would ask me, I would definitely recommend JRS. Very happy with the router. The difference in radiation is noticeable especially if you are sensitive to EMF radiation. It is a very well thought out device and the settings allow you great flexibility in how to configure it. I love the ability to turn on/off the WiFi with the button. A lot of wireless routers don’t offer that capability. Jan is also very supportive and answers email promptly and kindly. It is a pleasure to support a pioneer like him. Thank you Jan. Very happy with this router! I bought it because I wanted the wifi off at night and that was not possible with the router I had. I was willing to sacrifice some speed and range. That turned out to be unnecessary: this router actually has more range than the previous one! I have the feeling that it is ‘quieter’ when the wifi is off at night and I like that the ‘fixed network’ can still be on. By being able to easily set the time that the wifi is switched off, we can help ourselves a bit to stop using the internet. Fortunately, our Sonos music system works fine too, that was a challenge with both customer services, I am also very satisfied with that. The manual and the customer service are really very good indeed. 1. How do you like the JRS Eco-Wifi? Excellent, so far no malfunctions and it works perfectly. 2. What motivated you to buy the JRS Eco-Wifi? Because of the ‘LOW’ Wifi settings, and the ability to set a wifi schedule so that there is no wifi in the house at night. Basically to everyone, but it is a bit expensive. A first rate product, the wifi is fast and stable. The modem has many possibilities for critical users to adjust the settings themselves. The radiation in daily life keeps increasing (at work, in schools or on public transport), which is precisely why I have bought this modem to reduce the radiation at home. A safe home for us and especially for our small children who are more sensitive to radiation. Recommended for everyone and for our immediate neighbours! I’m having a great experience with my 05AC Router. I have it set on the lowest wattage possible for low radiation, and the internet is still fast enough to stream movies on our projector. I would highly recommend this to anyone who wants to be safer from radiation. I love the nighttime feature that allows me to turn off the WiFi automatically at night. I even like that I found videos on YouTube where customers confirmed that it works with radiation detectors. It’s pretty awesome! A great product! I have had the WiFi router in my home for a few years now and am very satisfied. Nice to be able to switch the WPS button quickly on and off so that I am less exposed to Wi-Fi radiation. Customer service is very good and everything is properly explained, how to install and update it, so that even I, a person with no IT knowledge, can do it. Great! I found out about the JRS Eco Wi-Fi software because I wanted to have more control over my family’s exposure to radio waves, and because Apple had removed the little control they once had over power output from their Time Capsule products. I can feel the effects of the radio waves and would switch off the Time Capsule at night, but had reached the point where I was considering switching off completely. I looked for low power output solution and discovered JRS, as recommended by another website. When I learned more about it and how wi-fi routers work in general, the JRS option seemed just what I was looking for, so I purchased it. When I received my converted router, I was very impressed by the amount of control that the JRS software allowed – all the variables that I was looking for and more. I tried it out and, using an EMF meter checked the output. In this way I discovered a discrepancy that I raised with Jan-Rutger who immediately traced it to a bug in the software. Jan-Rutger gave me an immediate work around and later responded with fix to the software. I am impressed at how the power output of the transmitter as selected in the software tallies with the measured output using an EMF meter. The router itself, the software and the service from Jan-Rutger are first class, and I am grateful for the work that he and his team have put into making this product available to us. After over seven years of insomnia, I slept easily in a friend’s house, and did not know at the time that she had no wireless router. When I moved to a new home in December, I purchased the JRS low-radiation wireless router and I have been sleeping well in my new place. I fall asleep easily, and I can go back to sleep easily if I wake up. The newer wireless cable modems got stronger through the years, and sleep became more difficult. I was treated for adrenal fatigue and insomnia. I am grateful for this new product that allows me to work calmly. I still use my wireless on my laptop and smart phone, but I am calmer when I shut the router off at night. I used to shut the cable modem off at night too, but still could not sleep. It seems that the signals given off by this wireless product do not affect my brain as much. The difference has improved my quality of life tremendously. 1. What doubts did you have before ordering the JRS eco-Wifi? That a European-configured device would it would function properly in the USA. 4. How many stars would you give for the JRS Eco Wifi? On a scale of 1 (bad) to 5 (good). 5. How many stars would you give for the service? On a scale of 1 (bad) to 5 (good). 1. What doubts did you have before ordering the JRS eco-Wifi? Without doubts. Wondered how much ease there would be with interchange between ethernet cabled and wi-fi connection. 2. How is your experience with the JRS Eco-Wifi? Smooth and clean. The interchange is swift and simple. After ordering several ethernet cables, “wi-fi – off” has been set as default with a code sent by email following inquiry. 3. What were the results of using the JRS Eco-Wifi? Prior to the JRS router there was always a felt mental/physical/overall cost experienced by just being in the house with wi-fi turned on. Before the ethernet cables arrived (so before setting “wi-fi-off” as default), the wi-fi being on wasn’t noticeable, for me, as it had been with the previous router. 4. To whom would you recommend the JRS Eco-Wifi? i) Everyone who has wi-fi (and children) in their home/workplace II) Everyone interested in bringing wi-fi (and children) into to their home/workplace. III) For those who value well-being. Inevitably, as awareness increases these and others will become the norm, as that is what is proper and correct – today, 3 years ago and tomorrow. 5. How many stars would you give for the JRS Eco Wifi? ***** 5 stars. I bought this router after a colleague who specializes in environmental energies and electrostress suggested it. We’ve had it for about a month now, and it’s really great. I love the feature that allows me to schedule it to go off at night and come on in the morning. Prior to this, I was unplugging my router at night and plugging it back in each morning. What a nuisance that was! Now I have reduced our exposure very easily. I’m very grateful to have found this product. I believe that the less exposure to EMFs we can have, the healthier we are. I was amazed at how fast it arrived, considering it came from overseas to the US. And it was pretty easy to set up. I was also impressed with the quick response when I asked Support a question. I highly recommend this product. What doubts did you have before ordering the JRS Eco-Wifi? Whether it was as fast as other routers and if it would perform as a standard wifi router. How is your experience with the JRS Eco-Wifi? It has been very good. What are you most satisfied with? That you can customize the functions. That you can send out the signal less and that you can turn down the strength of the signal. I like it that you can turn off the dual-band. I just use one band 2,4 ghz, I turned off the 5 ghz. I turn the wifi off during night. Anyone. I would definitely want my neighbours to buy it, as I’m getting fried by all their wifi. How many stars would you rate the service on a scale from 1(bad) to 5 (good)? 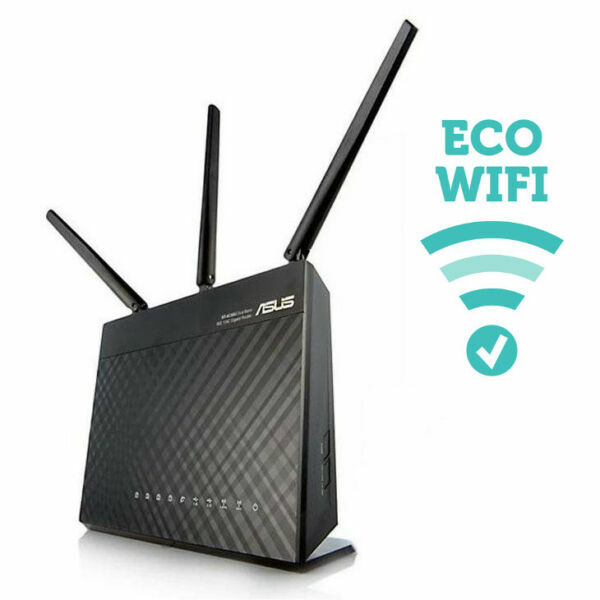 What doubts did you have before purchasing the JRS Eco-Wifi? Actually not very many doubts, only perhaps whether it would be possible to make adjustments in an ordinary router to achieve the same results, if you are a little handy, whether you could do that yourself. But more for convenience, I just chose to buy the JRS Eco-wifi. What is your experience with the eco-wifi? Very good, it is stable. It is true that it is a first generation of in terms of speed, you notice that. I have exchanged a considerably stronger router for this but there was a baby on the way, that was the reason. What were the results of using the eco-wifi router? It is of course supplied ready for use. I didn’t really need to set up a lot of things at all. I would like to log in to the settings menu again to see if I can reduce the strength a little bit more. Because for our little house it is just a little overkill. It is possible to lower that, but I’ve actually only logged in to the setup menu once. As far as that is concerned, it is all well and good. 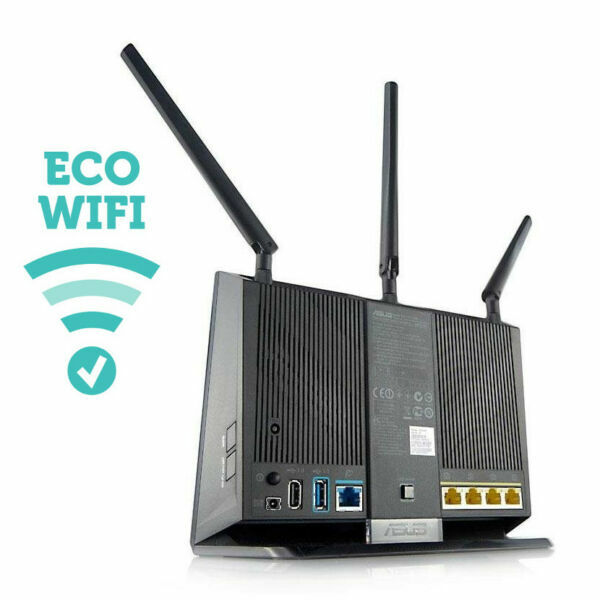 To whom would you recommend the eco-wifi? Actually to everyone. In this respect, the Netherlands lags very much behind other countries where it is already recognised that WiFi radiation and such like can have negative effects. I can recommend it to everyone but at the moment this seems to be addressed to deaf ears. If people can’t see or feel it, they think it doesn’t exist. What else is nice to tell? Compliments to you as a company that you have taken the initiative to work on this. I would recommend it to everyone. How is your experience with the Eco-Wifi? Other experiences or questions with regard to the JRS Eco-WifI? Is it also possible to set different on and off times for different days? Weekdays ask for a different rhythm than the weekend. (Note JRS Electro Health: Yes you can, by introducing several rules into Access Restriction). Actually to anyone who would not want to have wifi on all the time. I would indicate that this is the solution that we have chosen, and it works well. We have two children in the high school age and it is great to become aware how often they “need” the wifi when it is switched off and how healthy it is that the wifi is off occasionally. What doubts did you have before ordering the router? I don’t remember having any particular doubts, just seemed like a good product. How is your experience with the JRS Eco-Wifi? It is very good, we are still using it, I am using it right now. You can customize how you use it with the software. For families and family homes. Anything else you would like to note? Not really, I am definitely happy with the product. Do you switch it off during the night time and use the schedule option? Yes we use the schedule option, sometimes we switch it off as well. 2. How was your experience with the JRS Eco Wifi ? What are you most satisfied with? I have replaced two Apple Airport Extreme Base access points in my home office. (These Apple Devices were the best access points I’ve touched so far. More on this later). WiFi Roaming of the JRS EcoWifi APs seems to work less effective compared to Apple’s, it tends to stick to the weaker source longer. But otherwise – all feels well. 3. What were the results of the use of the JRS Eco- Wifi? We are excited about the fact that it is possible to work productive with just 2 mW. We think we can notice the enhanced ‘Wave-peace’ clearly. My wife (she is on border of E-Smog Hyper-sensitivity) reports she feels better. 4. To whom would you recommend the JRS Eco-WIFI? To absolutely everybody! (Well OK, for indoor use). It is very hard to imagine anyone who would not profit from it’s use. Living completely without WiFi is very, very hard, just think of Smartphone updating and WiFi Telephony at home (given you have the right iPhone version and the right provider, of course). 5. Anything else you would like to note? The last wave of MiMo-capable (although in downstream only) WiFi access points has brought several “high end” devices, from Linksys and others. They have up to 8 external antennaes, are especially expensive and especially difficult to clean. We need to keep an eye on them, still. Five stars. I am a deployer, I am IT engineer, I’ll try not to ask too stupid questions. I had one question, and the second level support works wonderful. Great customer service (contacted by mail), fast delivery and very well packaged. When I connected the router and tested the speed I was severely disappointed: from 250 Mbits to 30 Mbits. But…. that changed very quickly. After a number of times changing the antennas (because that one centimeter makes for an increase in many megabytes) I’m back to 250 Mbits per second. This router is tested extensively by Hardware.info and they found out that moving / sliding / rotating antennas suddenly yielded a huge speed improvement. When testing the it router fell accidentally, and that suddenly doubled the speed. This router is one of the best. In 2013, this router (Asus) has received a Golden Award for performance. My personal experience is: take the time to get to know this router. Take the guide and review the settings. When I did not understand something, I consulted my great friend “Google” that gave answer to all my questions. Bit by bit you get the best settings and learn to know the router completely. Very important: Do not update with the firmware from the Asus website because then you’ll lose your Eco benefits. This I have checked with the creator. An advice for those who do not have a fast internal WiFi card have (or have no wifi card). My internal wifi card proved to be strong enough. A search on the internet gave me a great solution in the form of an external WiFi adapter (TP-Link TL-WN822N adapter). Plug in, install drivers and you are a Porsche on the internet :-).